Walking in the moonlight on King Street after a warm rain tonight, I thought I saw something hopping across my path. I switched on my flashlight. A tiny Pickerel Frog (Rana palustris), no bigger than my thumbtip, gleamed on the wet pavement just a foot from the berm. Far behind us, a car was approaching. Quickly kneeling and laying the flashlight pointing at the frog, I took half-a-dozen exposures before he jumped into the weeds. 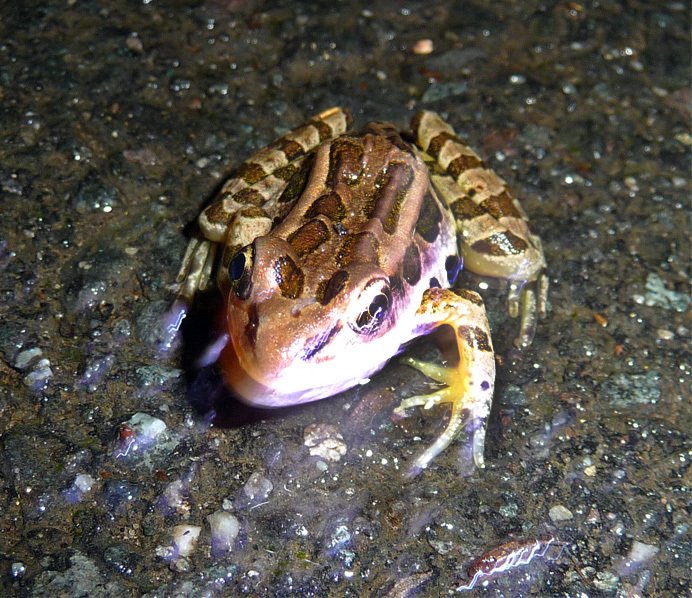 The Pickerel Frog is one of few in the United States that are poisonous. Their skin secretes a toxic substance that can kill snakes, who avoid them. This one is probably a female, because its thumbs and forearms are skinny. It will take two years to grow to sexual maturity. A few weeks from now, it will burrow into mud or sink to the bottom of a stream to lie dormant for the winter. When I was a boy growing up in the Endless Mountains of Pennsylvania, one January afternoon I chanced upon a deep spring that a hermit living in the woods had walled up to serve as a water supply. Peering into the pellucid water, I was amazed to see a layer of dead frogs stretched out among the oak leaves and hemlock needles on the bottom. "Johnny certainly won't like this," I thought, imagining the hermit coming by to refill his drinking bucket. I took off a mitten, thrust an arm elbow-deep into the icy water, fished out the dead frogs, and laid them on the snow. Reading about pickerel frogs many years later, I realized that the creatures hadn't been dead at all—at least not until I stranded them in the snow. Thinking on this, I suddenly became aware of a rushing sound at my back—the approaching car. As I prepared to dive into the weeds after the frog, the driver, apparently seeing my light, gingerly passed on the opposite side.